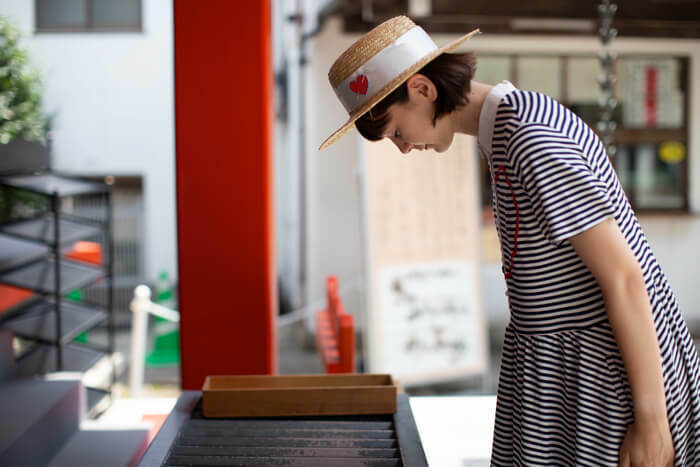 In the Tokyo Stroll series, we take you on a trip to various locations around Japan’s capital. One of the frequent locations are shrines where our navigator Ellie adds to her goshuin collection. 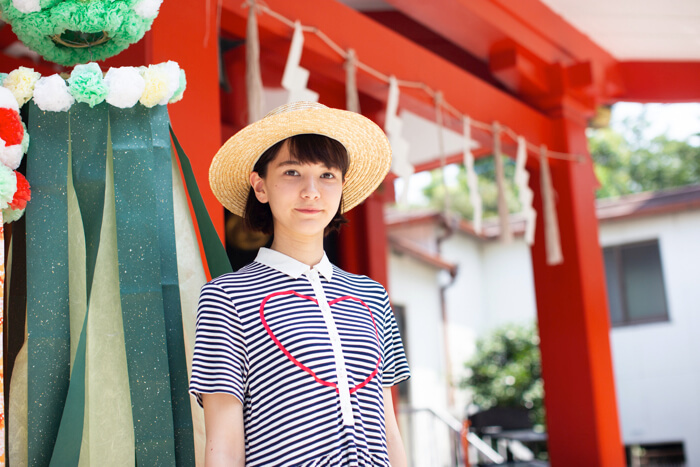 In this entry, Ellie visits Azabu Hikawa Shrine which is located in the district of Azabu-Juban known for being referenced many times in the Sailor Moon series. Azabu-Juban station is the closest station to the shrine. Naoko Takeuchi, the author of Sailor Moon, actually lived in Azabu-Juban when the series was being serialised in Nakayoshi from 1991 to 1997. 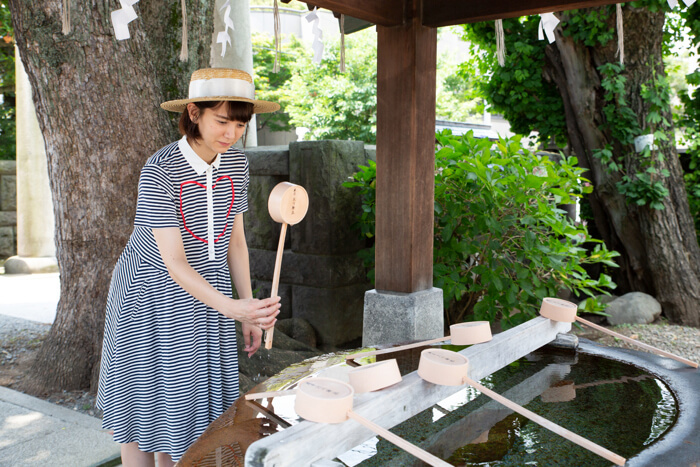 The shrine was used as a model for Hikawa Shrine where Rei, or Sailor Mars, worked as a shrine maiden. 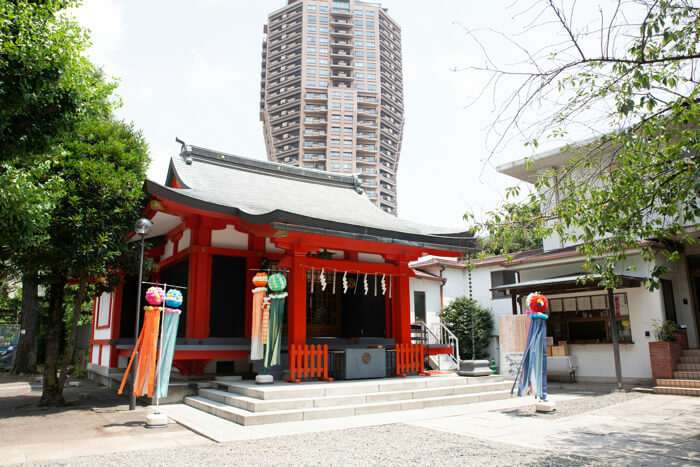 The shrine can be found just a 10-minute walk from the station past the rich residential area where the embassy is. It’s enveloped in a bright green oasis of trees. The main shrine is a vivid vermilion. Enshrined there are the deities Susanoo-no-Mikoto―the young brother of Amaterasu, the goddess of the sun and the universe―and Yamato Takeru no Mikoto. The shrine is seen as lucky for many reasons. People pray there for increased luck, business prosperity, warding off evil, better fortune, success in life, wealth, safe childbirth, protection against misfortune, academic achievement, exam success, family safety, marriage, national security, and more. When Ellie visited the shrine was decorated for Sendai tanabata. 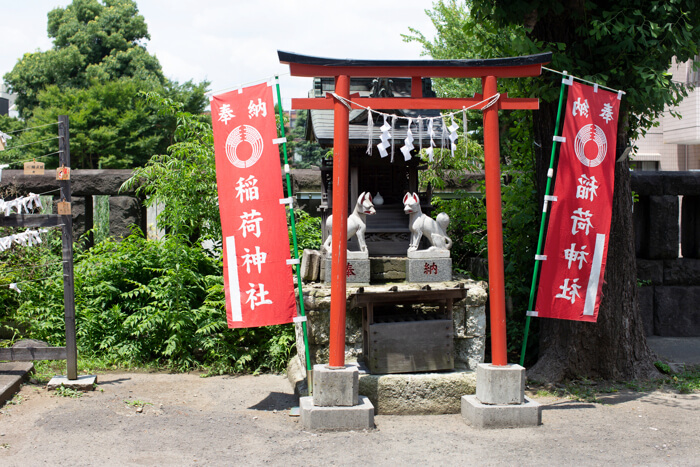 There are many Inari shrines in Japan which are erected to worship the god Inari. There is one here too as pictured above. It was originally located at a nearby daimyo residence for the Sendai domaign Date clan during the Edo Period but was relocated to Azabu Hikawa Shrine at the beginning of the Showa Period. 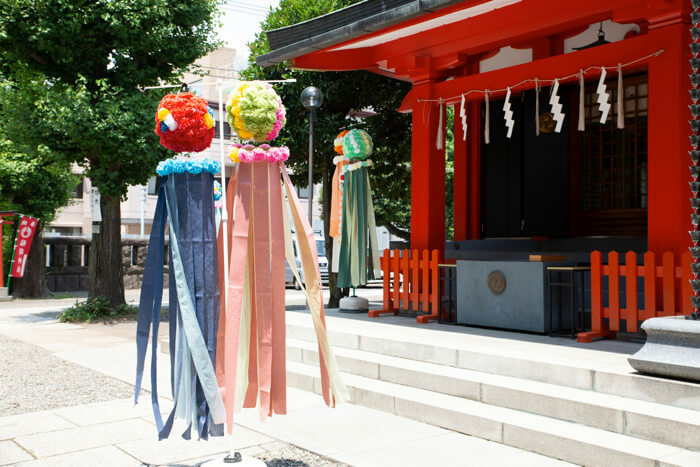 For this reason it has strong ties with Sendai, hence the tanabata decorations, which will be there until August 8. 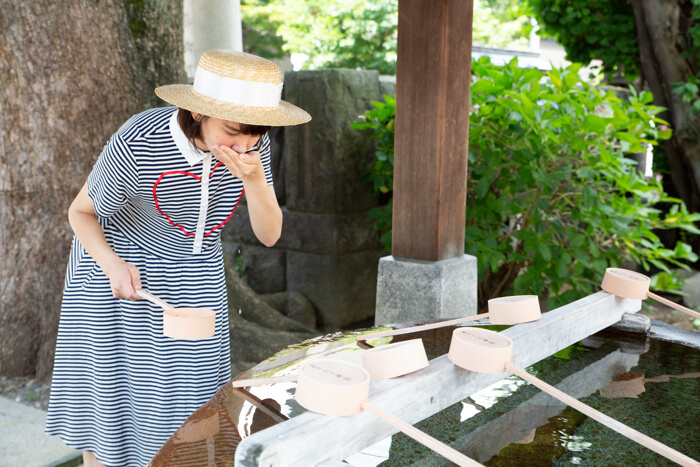 It was time for Ellie to head to the chozuya (also known as temizuya) to cleanse herself before praying which is part of shrine etiquette. Take the ladle with your right hand, scoop up plenty of water, and rinse your left hand first. Next, switch hands. Hold the ladle with your left hand and rinse your right. Then take the ladle with your right hand once more, pour some water into your left hand and rinse your mouth. Never bring the ladle directly to your mouth, and do not swallow the water or spit it back into the basin. There will be an area below the basin, like a bed of rocks, where you can spit the water out. After rinsing your left hand one more time, pour out any remaining water into the rocks (never back into the basin), and return the ladle. Having cleansed herself, Ellie headed to the main shrine. When praying, remember this: two bows, two claps, one bow. Straighten your posture and begin with two bows. Clap twice, pray, and bow one final time to finish. It’s time for the main event. Getting that goshuin! It costs just ¥300. This goshuin includes a stamp of Azabu Hikawa Shrine as well as blue and pink Sendai tanabata decorations. It’s a very colourful goshuin and is only available for a limited period of time. 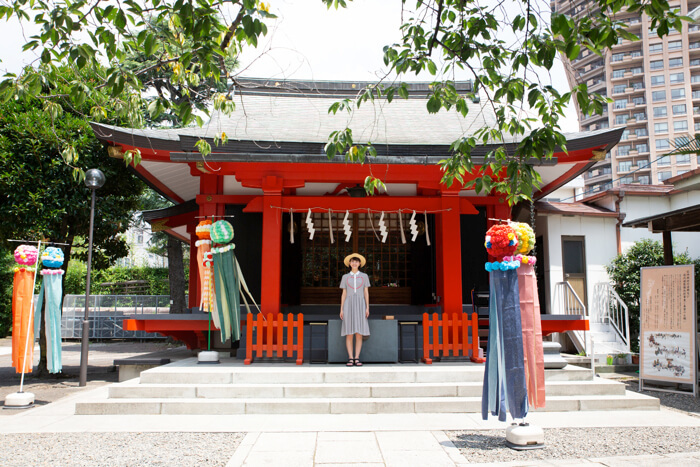 Not only is Azabu Hikawa Shrine loved by locals as a place of worship, but because of its Sailor Moon references. Fans flock to the shrine, as do the staff of the ongoing Sailor Moon musical. 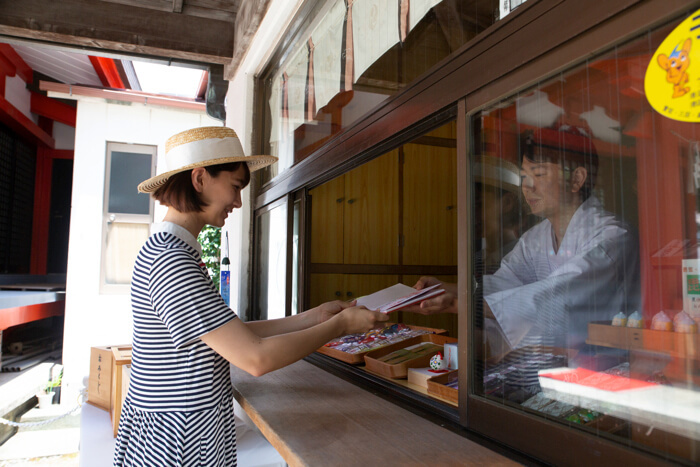 The number of people visiting the shrine from Japan and overseas is increasing. If you’re in Tokyo, make a trip to this iconic spot. 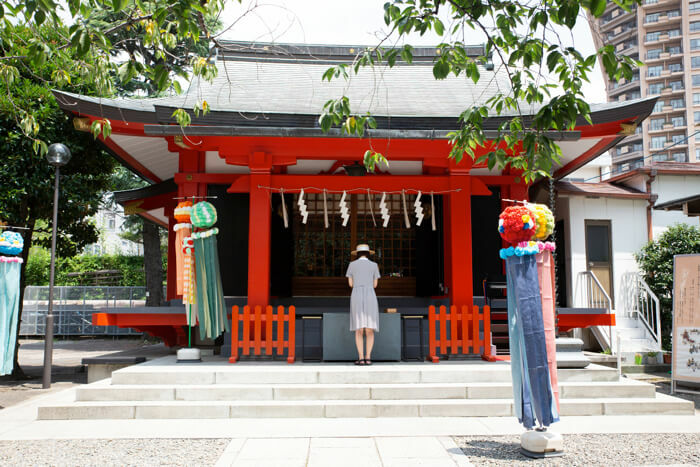 5 Shrines & Goshuincho in Tokyo Recommended by MMN – Pray For Love, Success and Better Fortune!